Are you ready to learn how to get rid of fear once and for all? Imagine fear never slowing down or stopping you again? Although it sounds impossible, this is how God designed you to live. After witnessing fear fall away from the lives of those I have worked with, it’s time to bring these teachings, insights, and techniques to you. In this exciting 49-day course, my teachings, insights, and living support accompany you in achieving the boundless success that fear has kept you from in the past. Fear is NOT False Evidence Appearing Real. Learn how to become fearless in every area of your life and become unstoppable in your fearlessness each and every day of your life with this 7-step process of removing fear once and for all. This new, revolutionary offering provides you with a focused plan that yields incredible results! Learn how to fully walk, talk, breathe, and think fearlessly – no more faking it. Your fearless self will be called forth with this proven, step-by-step process. 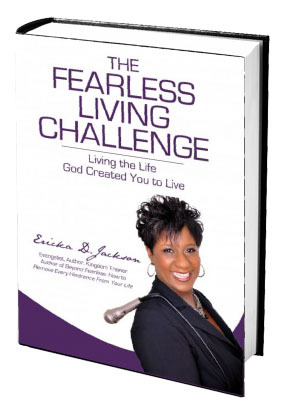 This book walks you through the step-by-step process of living on the other side of fear and how to remove barriers to creating the life God has always shown you as possible for you. 157 pages.